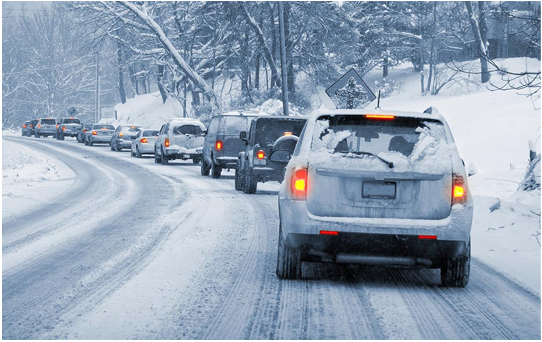 This winter is going to be rather cold and snowy in Rockland County so it would be a good idea to recall a couple of recommendations on safe winter driving. Below you can see the main driving tips to keep those in mind when it is snowing. Provide yourself with comfortable and safe conditions of driving. Remove all unnecessary stuff which distracts your attention. Replace your regular rugs with the special winter rugs so that legs won’t slide on the foot pedals. Always carry a brush, a shove, gloves, a towing cable in case you need to clean your car from snow and ice. For any unforeseen situations it is good to have at a warm plaid, winter clothes, footwear. Get rid of summer style of driving. Strictly observe a distance ahead, however do not be overzealous and do not provoke other drivers to overtake dangerous situations. Follow the speed limitations strictly! Watch closely road situation and be ready to any surprises. It darkens early in winter, and people often put on clothes of dark colors which, naturally, do not reflect the light. Therefore it is easy not to notice the pedestrian when he crosses the road. Keep that in mind if you want to avoid accidents, as most of the pedestrians do not think about that. Remember that it is much more harder to stop the car on the slippery surface, and there is a huge chance you won’t manage to stop if the pedestrian appears right in front of your car – so lower the speed if do not see whether there is someone going to cross the road in front of your car. Watch carefully for the surface of the road. Even if the temperature of air is above zero, it does not mean that the road surface is no covered with a thin layer of ice. Therefore don’t lose vigilance. Perhaps, the most unpleasant type of a covering in winter time is this mash of snow with mix of dirt and reagents. Your brake way on such a surface is at least 1.5 longer than in dry conditions. If your car isn’t equipped with ABS, professionals advise to apply the so-called pulse braking – several short pressings on the brake pedal if you want to stop the car. Such a method is especially effective on roads with ice layers on the surface. However, driving cars with the anti-lock braking system it is possible to stop the car promptly like you do it in summer, but generally on the winter road it is strictly recommended to press the brakes smoothly. Before pressing a brake pedal into the floor, look in a rear-view mirror: the driver behind you may appear closer than you expected and there is a chance he isn’t familiar so well with the principles of winter driving. Due to slippery surfaces, the car tends to continue moving even after the wheels have technically stopped spinning, so it is better to move slower than quicker.